We walked between floodlights and domed hangars under the night sky, following the crowd to the start line. My wife Steph was running her first (and likely only) half marathon along with her sister, mom and uncle. An hour before they were due to start, I would begin the marathon with my father-in-law Steve as his pacer. 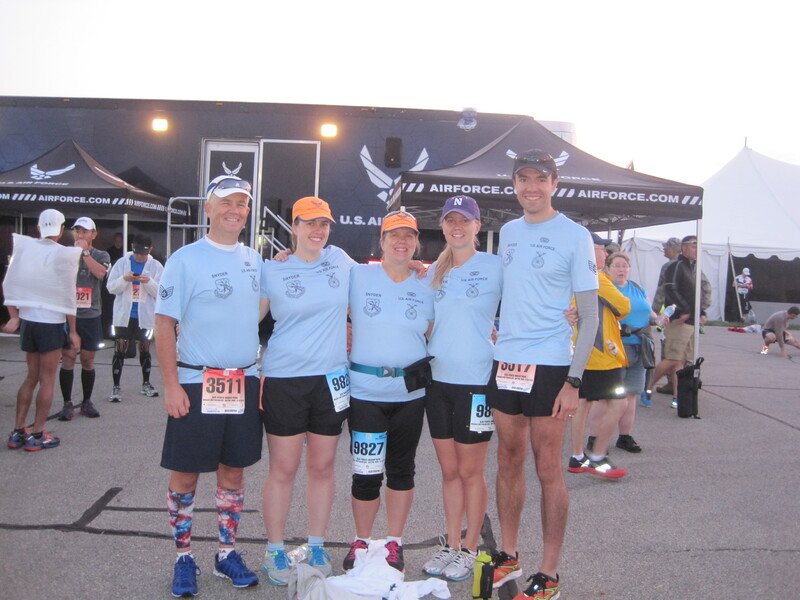 This race was particularly significant for Steve, because not only was he in the Air Force for six years, it would be his first marathon since 2008. Both of these reasons imbued him with omnipotent Dad Power, which meant he made t-shirts and signed up the entire family for the event. I was a little nervous. 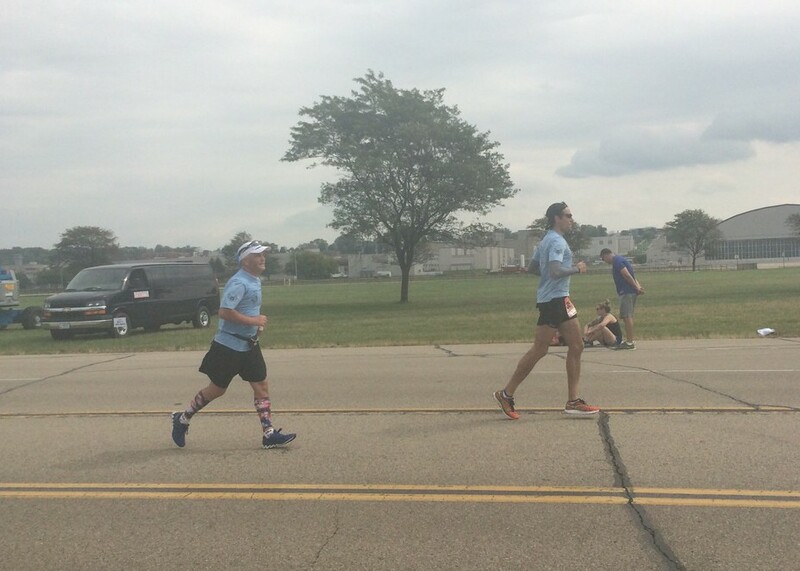 It wasn’t the marathon distance that intimidated me, but the task of being Steve’s pacer. Before I had even run two miles in my life, he had already earned several marathon and triathlon finishes. I went to watch him run the 2006 and 2007 Chicago Marathons, years known respectively for being very cold and dangerously hot, and felt completely humbled (and intimidated) by what I had just witnessed. Today, I hoped that I would be able to guide him through the race without feeling impertinent – after all, this was the guy who taught me how to run six years ago. By 7:30 in the morning, as darkness gave way to a pristine morning at Wright-Patterson Air Force Base in Dayton, Ohio, it was time to start. The race began with the unexpected, full-bodied boom of a cannon, instantly sending my heart crawling up my throat. We started our watches, shook off the nerves and took off with one helluva roar. The race website, literature and even satellite maps gave me the impression that we were going to run purely within the base. If you close your eyes and imagine a typical airport, I’m certain that your mental image will not include trees or shade. And for a large part of this race, that’s how we ran, climbing high into the sun. 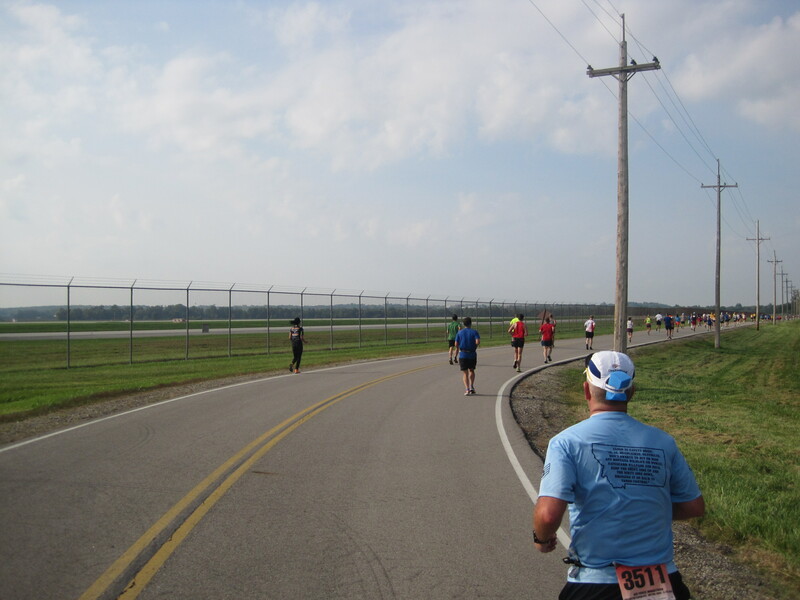 The first 5k had most of the hills, rolling over the Air Force Institute of Technology’s campus and by the Wright Brothers Memorial. We cruised past the Wright State University Nutter Center, where we had picked up our race materials the day before, and then the course ushered us to the McClerron Memorial Skyway for longer than I would have wanted. 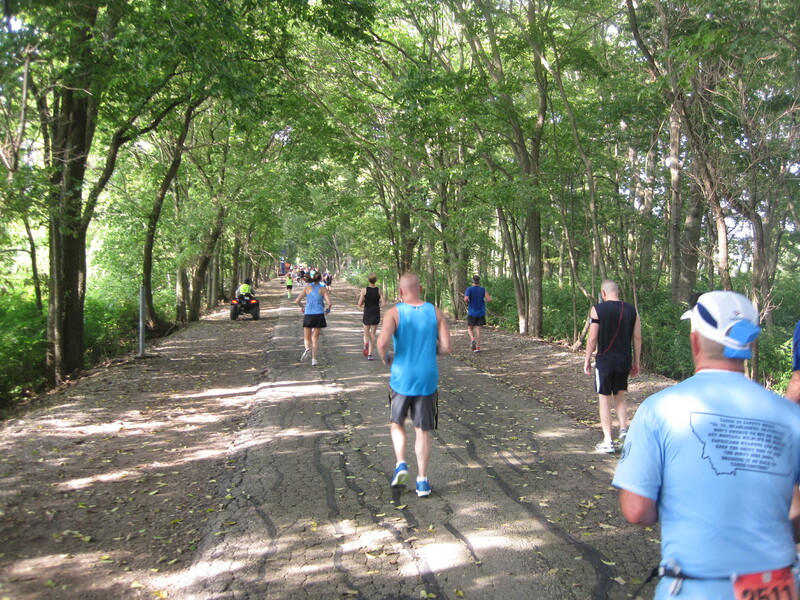 Eventually we reached the Wright-Patterson Golf Course at 10k and happily welcomed the cover of trees. This was a delightful change of scenery. Though most of the surrounding area for the entire race was green, the actual trees themselves were always too far away to provide any shade. But we felt instantly cooler once the course narrowed on the golf course. Steve and I had started walking a minute for every ten minutes of running, though still keeping an even pace. 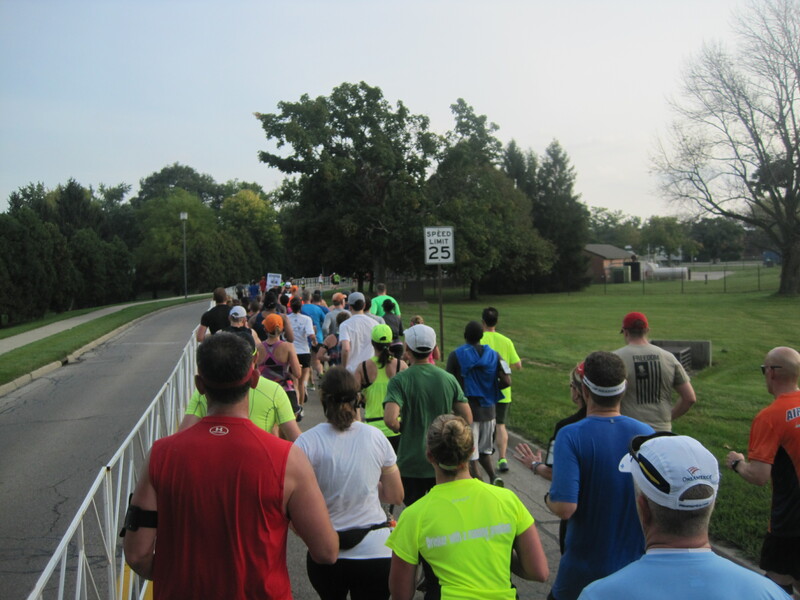 For the next 10k we would run through Fairborn, a small town just northeast of the base. 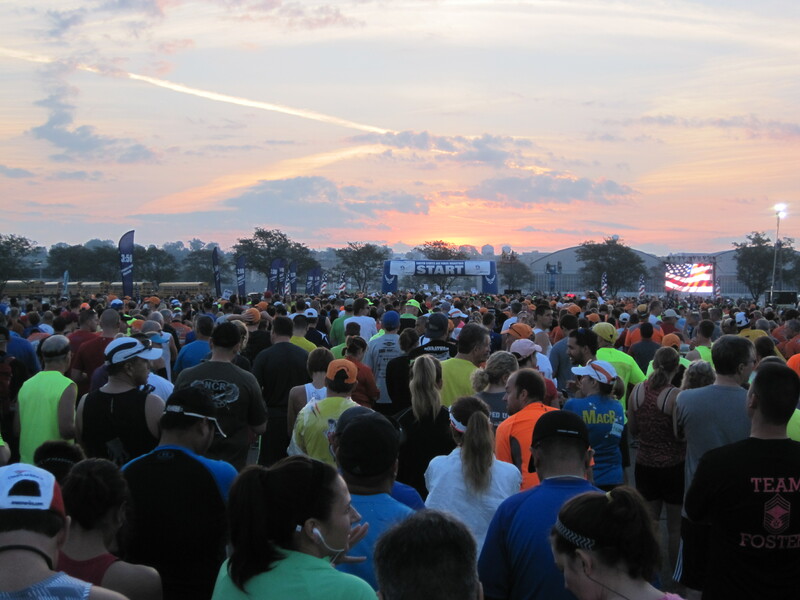 We wouldn’t see this many spectators until the finish line, but our attention was focused elsewhere. It seemed like this part of town was looking forward to Halloween like a kid going to sleep at 3 PM on Christmas Eve. 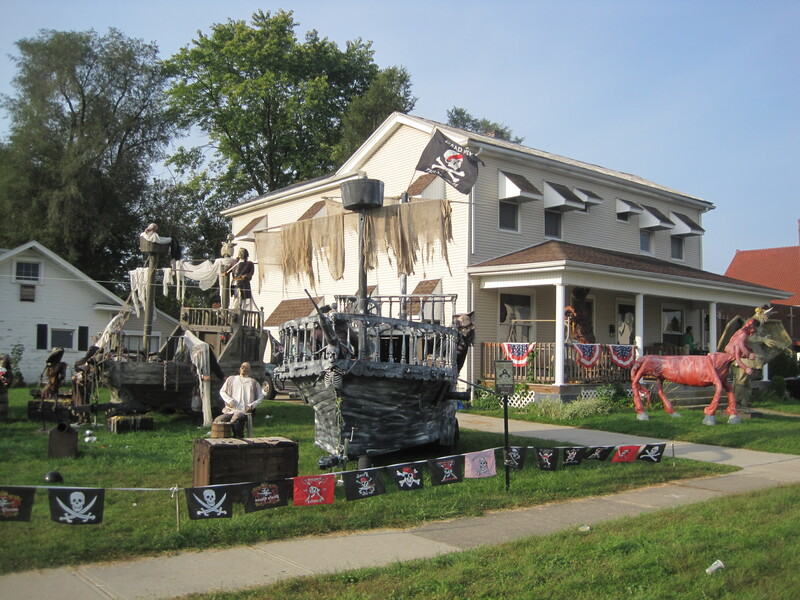 Every other store was displaying spooky wares and one family had erected a professional-grade ghost ship on their front yard. There was even a house with a “ghoul train” on its lawn and a two-story tall Grim Reaper fastened to its façade. 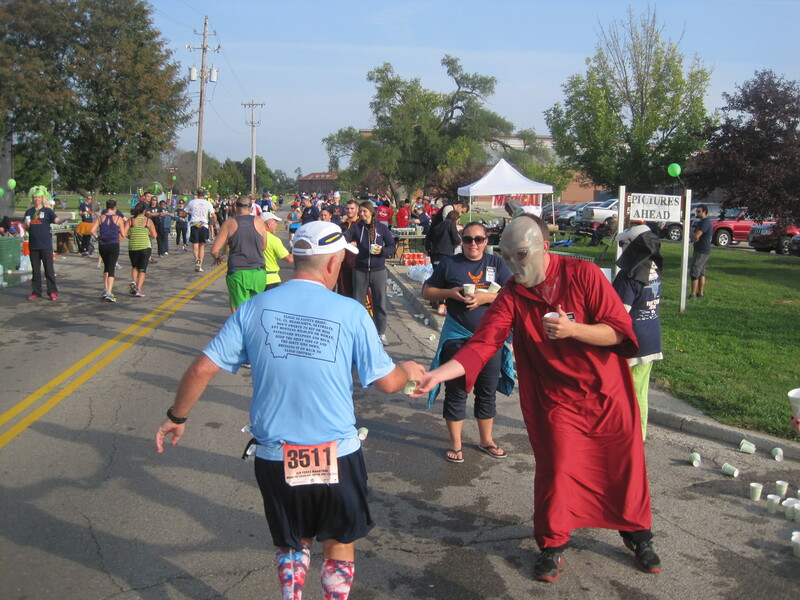 It was easy to forget that we’re still five weeks away from All Hallows’ Eve, but they all made for excellent distractions as we crossed mile 10. As we made our way out of Fairborn, I kept noticing that Steve was steadily pulling away from me. I didn’t want to temper his enthusiasm too much, but we were out here to run a smart pace. “Let’s reel it in a bit,” I would say, keep the wings level and true, and he’d dial it back. Once again, I felt a tiny twinge of impertinence because I felt like I was putting a stopper on the pent-up energy he had stored over the years, waiting to burst out. 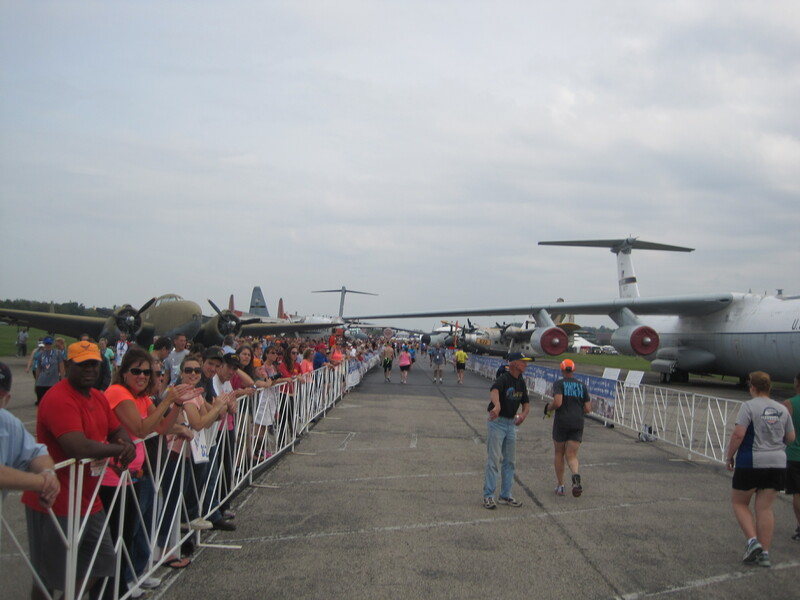 Once out of Fairborn, it was time to run around the perimeter of Wright-Patterson Air Force Base. As you might imagine, it’s an enormous sprawl of land with few trees to provide any shade. As we wrapped around the base, Steve began talking to a fellow Team Red White & Blue member. He soon learned that his new friend was stationed at Malmstrom Air Force Base, where Steve spent six years as a missile security officer. They talked for about a mile about who did what, what happened when, what is and what isn’t. Making quick friends has always been one of his core competencies and had we not reached an aid station, I don’t know when the conversation would have stopped. Part of me wanted to pull him away and get him to re-focus on the race. But that would have been cold; he was having so much fun. After all, we had just run a half marathon just shy of his all-time PR and had plenty of energy to keep up an animated conversation. This wasn’t always the case. Sometime in late 2008, Steve’s body rebelled against him. The well of energy that had always provided him with enough kick to participate in long-distance races, work a difficult and challenging job and be the best family man this side of Hobbiton had suddenly and inexplicably run dry. By 2009, he was walking half marathons because he couldn’t quite pick up the pace. 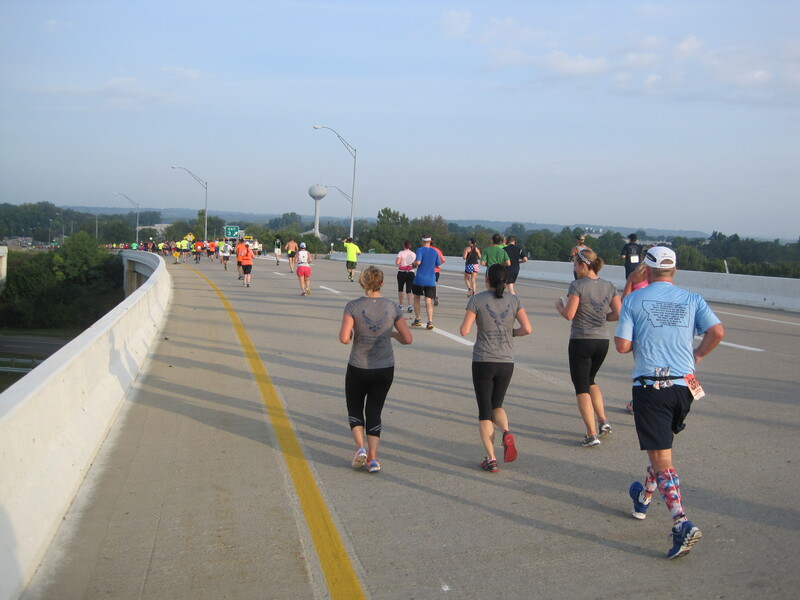 In 2010, when my own running exploits were gaining traction, he had to drop out just shy of the second mile of the Indy 500 Festival Mini-Marathon because he didn’t have it in him. He got blood work done, changed his diet, got tested for allergies and saw doctors of every ilk, but the mystery went unsolved. He gained weight and felt increasingly imprisoned by this inescapable lassitude, sometimes spending dark days in the basement alone with his thoughts. Oddly, this decline coincided with a surge in running by those around him. By then I was literally running wild with the sport and not long after, his brother men, Greg and Jim learned to fly, becoming marathoners themselves. His brothers-in-law Scott and Dan soon followed while Steve could only watch from the sidelines. I remember asking him once if he would prefer that I keep my running stories to myself, because I began feeling a little obnoxious talking about my most recent PRs. It felt like happily feasting in front of someone who hadn’t eaten in days. He said no. Not only did he take pride in knowing he had set me on the running path, but these stories were exactly the kind of motivation he needed. Mile 17: Wide open, sunny stretches were frequent. Under warmer conditions, this race could have been much tougher. During this time, he became an avid scuba diver, dedicating himself to the activity and joining several charities aimed at helping veterans assimilate back into civilian life through scuba missions. His passion for the underwater world mirrored his diehard pursuit of endurance sports, but part of him was always itching to get fully back into the running game. You could hear it in his voice when he’d give tips or lend gear, that telltale enthusiasm that lets you know he hadn’t forgotten anything. But he managed to turn things around. With help from his family (most notably his wife Jan), he changed his diet, refused to stay down and began to slowly climb out of the basement. Whatever was ailing him was never truly discovered or even named, but that didn’t stop him from putting in the time and sweat. His training went into overdrive during an emotional trip to New Jersey in the summer of 2013. It was a warm, muggy day on the eastern coast. I wore shorts and a salmon colored Polo, hoping it would unite the conflicting goals of staying cool and looking somewhat respectable. But the heat of Leonardo was oppressive and after walking for a minute dragging scuba gear through the sand, I could feel the sweat dripping down my arms. My in-laws were gathered along the beach, unsure if the occasion warranted a dose of their natural charisma or a helping of sober reflection. Because all of them, uncles, cousins and those who cleverly used marriage to sneak in, were there to remember and pay tribute to the family matriarch, who had passed away the previous summer. Mile 19: A shaded service road comes to the rescue. While most of the family stayed on the sand, Steve and his brothers walked into the frigid waters of Sandy Hook Bay to bring Gram back to the shores of her childhood home. They released her ashes into the icy waters and left a stone with her name engraved on it, a memento for the remarkable woman who raised the wonderful, supportive family that so eagerly embraced me. Speeches were given and more than one fond memory recalled before a ponderous, and rare, moment of silence. Not long after, there was a lunch at a nearby restaurant, where it seemed like all sorrow and solemnity had been washed away by the zany extended family that we seldom get to see. It was easy to think at the time that Gram would have wanted it this way. By that point, he had already started the comeback. He had been training regularly and had run the Hoover Dam Half Marathon with us, preparing for Moab and later Miami. It was then that he dropped the megaton hammer on us by revealing that he had signed up for Ironman Cozumel. There it was, the massive 140.6-mile carrot that would dangle before him, the bright beacon on the horizon pushing him to train harder than ever. 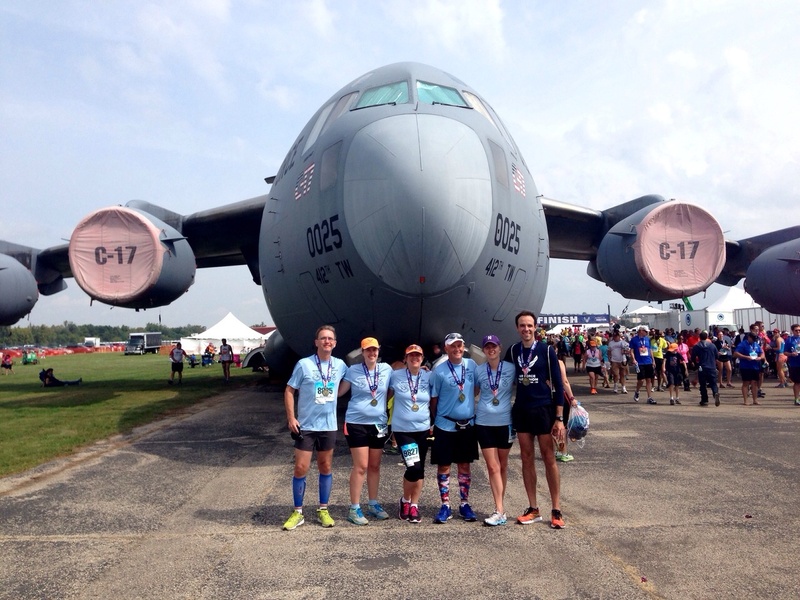 The Air Force Marathon was part of that plan, and there we were, cruising past 40k. The final U-shaped stretch was lined with American flags followed by a fleet of intimidating military planes, all facing us as if ready to fly into the wild blue yonder. As we made that final turn, the chutes closed in on us, the finish line a bull’s eye just ahead. Enormous black and green wings passed above us like the arms of a slow-moving fan, with crowds cheering underneath. We passed a Lockheed C-141 Starlifter, then an AC-130, and finally a giant Boeing C-17 Globemaster before reaching the blue finish banner. There were 26 miles of running behind me, but so many more behind Steve. The last six years had been a frustrating series of races that ended too soon or stretched on for too long. But here he was, running what was quite possibly his fastest ever marathon. We passed every plane and crossed the finish line, making our way through a large, white tent to meet up with the rest of the family. Everyone was smiling, if not a little achy, and ready to head back to the hotel for a shower. The rest of the weekend was spent eating, napping, watching movies and visiting the Museum of the US Air Force. Even if nobody had finished the race, or if we had all been carted off the course in a medical van, what mattered most was that we spent a fun weekend with family, learning about Steve’s time in Montana with the US Air Force. But if I too live to be a grey-haired wonder, I hope to still be knocking out races like this. This made me tear up a little. It’s been a long road back for me and I’m still not there yet. I hope I can experience a comeback like Steve did and have a great friend along with me for the ride. Great report!! Thanks for reading. This experience has taught me that, though the going may be slow, if you really want back in, you can do it. I’m certain that you’ll be back to your marathoning days – and when you do, each finish will taste so much sweeter. I’m suprised they would let you run on base, then leave base and come back on. Good for your Uncle. It must have been tough going through all of that with no answers and just the determination to beat the un-named what ever it was. That is a good point, but it never occurred to me. Before we entered the Start Area, they did walk us through metal detectors, but never during the race did I feel like we were abusing privileges. Runners are good people though, so I don’t think they were too worried. Way to go, Steve! Great work! Welcome back to the marathon game! Can’t wait to hear about that Ironman too! Nice job, pacer! I remember meeting Steve a couple years ago. Super nice guy. Talked like we’d known each other for years. Yes sir, you guys talked at Ice Age last year — he’s definitely a magnet for people and knows how to charm. Thanks for reading Jeff! A great and inspiring story. All comeback stories from serious illness, injury or other problems are always inspiring, but Steve’s story is something I think most of us who are fortunate enough not to have any serious medical issues, but have our ups and downs in life can very well related to. And I think so far this piece is your best writing Dan. Thanks for your kind thoughts, Laszlo. You know, since you switched to your own site a while back, I don’t get notified of new blog posts from you. I’ll go check those out shortly, as I feel like I lost touch with your marathon progress. And yes, everyone has their own struggles, but it’s good to put them in perspective sometimes. For me, not running for 10 days means something is wrong — so to put it off completely for years is something else. And if I live to be a grey-haired wonder, I hope to have a steadfast pacer to document it all by my side. Huge congrats to Steve, there can’t be a much greater physical and psychological challenge than the unseen enemy playing by its own rules (see: Geoff Roes). 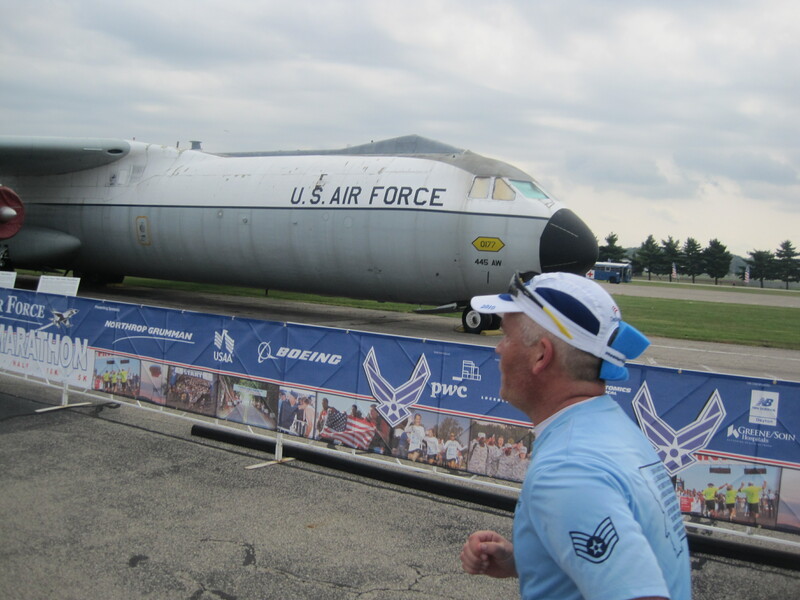 Having grown up the son of an Air Force officer – and I’ve already penciled in the Air Force Marathon as my Ohio race – Steve’s grit and resolve are familiar qualities. But hey, no time to get too caught up in back-slapping and laurels-resting… there’s an Ironman to train for! Nice job too trying to slip that second sentence by us… congrats to Steph on conquering her own half marathon. 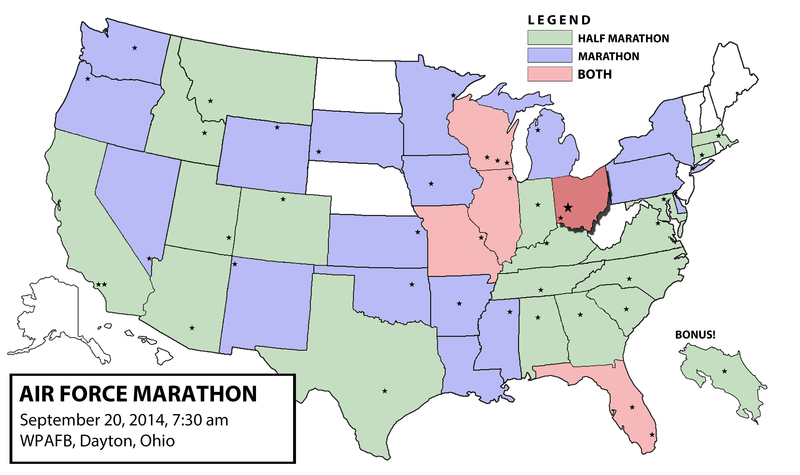 I assume you’re calling it her “first (and likely only) half” because she’s moving up to marathons…? Yeah, that was another big story that I could have written about. But honestly, she didn’t enjoy the training or the race, so it wouldn’t have made for inspirational reading. For your own sojourn to Ohio, whenever it will be, remember to bring a hat. And yes, no rest for Steve after this. I believe he’s doing a century this weekend and then doing a tri camp for most of October. The whole enterprise sounds insane, but then again, so do I to many people. Lastly, did you notice the “thing” I did in this post? Much like your Norcal/Socal post with the sprinkled Charles Dickens novels, I made a few references myself. I thought about writing about it at the end, but that would have ended the story on a trivial note, robbing it of a little emotional weight. Such a great recap, and so awesome that you have that type of relationship with your in-laws. Steve sounds like a hell of a guy, and congratulations to him for reconquering the marathon (AND to Steph for running her first half)! Incidentally, I think I just figured out how I’m going to decorate my house for Halloween! I think the only way I’ll get Steph to run another half is if there’s a very blatant and generous wine theme to go with it … so I’ll probably drag her to Santa Rosa one of these years and con her into running again. We’ll see. Thanks for reading and for chiming in. It was definitely a fun experience that was made better by having a cool (and disciplined) father-in-law. There is no shortage of stories of people with hellish in-laws and I’m thrilled to NOT be one of them. If the Lavenders are like Aaron, then I’m sure they’re great people too.